Online Pronunciation Dictionary and So Much More! The "8 in 1 English Dictionary"! Finding a pronunciation dictionary that is helpful, easy to use and affordable can be difficult. Most teachers and students are excited by what these resources will "do for them". But I focus more on what "you can do with these resources". So what can you do with a traditional pronunciation dictionary? Well, -to be honest- not much. You might be able to look up a word, see how the word should be said and maybe see it used in context, but is that really what you want to accomplish? ...to be able correctly pronounce words. ...to hear how words are pronounced. ...to know how to use specific words in context. ...to associate the words with images to help you remember them. ...and to learn words in groups based on phonetic sounds or even by themes. Now, if you could do all of those things with one dictionary that would be great and thankfully you can; with the 8 in 1 English Dictionary. If you search for "pronunciation dictionary" in Google, a list of web pages is provided and you will see the creators of this fantastic dictionary. English Computerized Learning INC. at www.englishlearning.com specializes in creating software and courses that enable learners (like you) to dramatically improve their pronunciation from the comfort of their own homes (and without a teacher). Until recently, their programs were only available by download or on DVD but there has been an exciting new addition to their product line, especially if you are searching for a program that includes a useful dictionary that is worth your time and energy. Allow me to introduce eEnglish the latest and most affordable resource created by English Computerized Learning, which is 100% online! 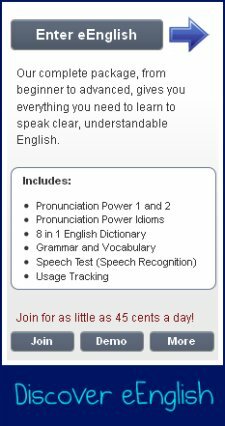 Not only does eEnglish include 5 powerful programs to transform your English pronunciation, it is available to you 24 hours a day! You are currently searching for information on the right pronunciation dictionary for you, so today I will be talking about my favorite, the 8 in 1 English dictionary. But if you are serious about significantly improving your English pronunciation (and your listening comprehension, idiom use and basic grammar) I highly recommend looking at eEnglish. "8 in 1 English Dictionary" include? If you would like some basic information about the course then you can visit www.englishlearning.com where they list all the features and tell you what is included. Today I would like to show you what the course is, give you my initial reactions to the course and demonstrate how to use it. So, rather than just write my thoughts and reactions, I created the following video to show you them. In this video I am using the 8-in-1 dictionary for the very first time; so sit back and enjoy! I Love the "8 in 1 English Dictionary"
When I review a course I try to look deeper than just at the features. What interests me is what a program or resource enables you to accomplish. 1) Search words by phonetic sounds that you have trouble with. Using the speech test (included in eEnglish) you can identify sounds that you have difficulty with. (clothes, car parts, fruit etc) which makes increasing your vocabulary quick and easy. 3) When learning a new word you can find related words or word combinations that include the word you are learning (computer vs computer programmer). 4) Test your pronunciation without a teacher present. Just record yourself saying the word and then compare your recording to the sample audio provided. 5) Most importantly, it works with many different learning styles. This dictionary includes audio, visual (photos), written and interactive aspects which allows the dictionary to adapt to your specific needs. So as you can see, this dictionary does so much more than a traditional pronunciation dictionary. It enables you to improve your vocabulary, pronunciation, listening comprehension and reading skills simultaneously. If you are looking for a useful, easy and efficient pronunciation dictionary then I highly recommend getting the 8 in 1 English Dictionary! Get the best pronunciation dictionary on the market and explore eEnglish today! Interview with Adon Lee, VP of English Computerized Learning (the creators of eEnglish).